File this one under “Live and Learn”. Most of what we do out here on the Ponderosa, does not come with a manual. We make it up as we go along. Sometimes it works out great, but more often than not, some tweaking is required to perfect it. Such is our grey water experience. Our grey water – from the kitchen sink, bathroom sinks, shower and laundry, empties into a large holding tank buried outside. The toilets empty into a central composting unit in the basement, so no sewage goes into the holding tank. Last winter, we had no problems with the holding tank, but we did have to empty it mid-winter. Since it has no sewage, we pump it out onto the garden or shrub beds. However, this is not much fun when it is freezing outside. This winter, we decided to see if we could last all winter without empting the tank. We emptied it mid-November and were hoping to get to March. In addition, we had to conserve water this winter. Our cisterns were full by the end of September, but we didn’t get any significant rainfall after. 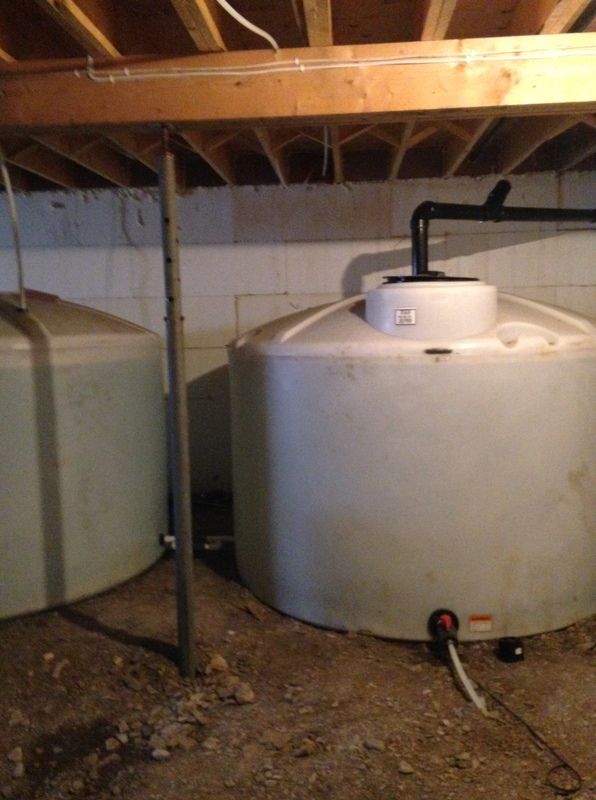 The previous year we had rain into mid-October, so we headed into November with full cisterns. To conserve cistern water we decided to melt snow for dish washing and dump that water outside rather than down the drain – easily done using two plastic washtubs. We almost made it to March. The day after Ken returned from his Mexican holiday (Feb 27), the water from the washing machine backed up into the shower. The holding tank was full. We shovelled off the snow and removed the bales covering the tank to discover a couple inches of ice. Breaking through that we emptied the tank only to discover the inlet to the tank had frozen. I guess our zeal to conserve water resulted in not enough hot water going into the tank. For the next four weeks, we had to manually empty the drain pipes after each water use by opening up a clean out in the basement and collecting the water in pails, dumping them outside. Not a terrible job but more than once we got drenched in cold dirty water. We tried thawing the drain by pouring boiling hot water down, to no avail. Since hot water is lighter than cold, I figure the hot water sat on top of the cold water in the drain and not getting down to the ice. We brainstormed all kinds of solutions. Perhaps if we could get down into the holding tank and crawl to the inlet we could melt it with a melt it with a torch. I went down the hole, but nothing could convince me to crawl to the end. It stinks down there and you have to crawl to through wet sludge. Eventually, we decided to try getting the hot water down to the end of the drain pipe where it was frozen. 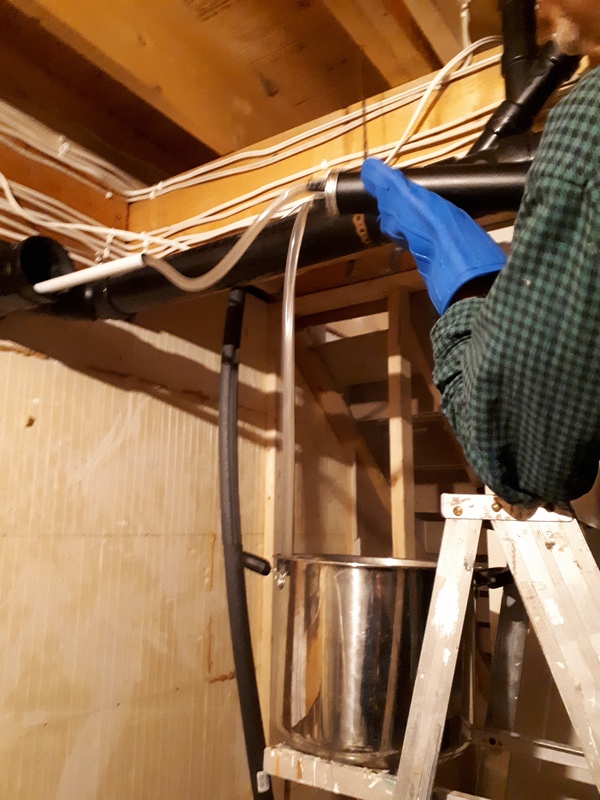 Using a transfer pump and a length of ABS pipe, we pumped boiling water down to the end of the drain. As we pumped the hot water to the far end, cold water trickled out the cleanout into a five gallon pail for emptying. Slowly, with each pot of hot water, we were getting further down the drain. After three days, we had melted through five feet of ice. Finally, we heard the sound we were waiting for. Woosh, and the last bit of ice cleared and the water flushed down into the holding tank. A few more pots of hot water dumped down the drain for good measure and our grey water woes were solved. No more hauling five gallon pails of water up the steps and outside. We celebrated with a nice hot shower! • We need to keep better record of the amount of water used during the winter and empty the holding tank before it gets full, even if that means a January pump out. The tank water must not reach the top of the tank where it has contact with the frozen ground. Having to empty the drains manually we did learn that Ken uses almost 7 gallons for his short shower and I use almost 5. A large load of laundry takes 12 gallons. If we kept track of showers and laundry we should get a good idea of how much water is going down the drain. • We need to empty the holding tank just before the cold weather hits, even if it’s not very full. Starting with an empty tank could buy us a couple extra weeks at the other end. 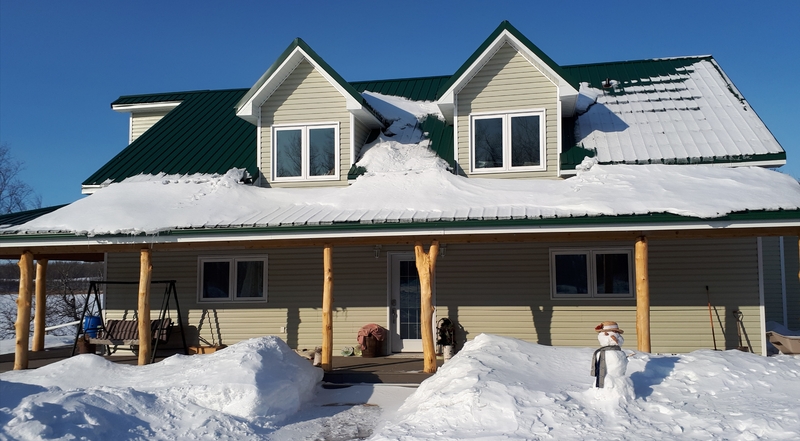 • Melting snow for dish washing helped us extend the cistern water over the winter. We started winter with less water and had very little snow melt off the roof this spring, but still we are doing fine with water. We should make it until the spring rains arrive. • We will likely continue using some melted snow for dish washing during the winter and continue to dump it outside. It is a great way to conserve our water and clean the snow off the deck at the same time. However, we will make an effort to dump very hot water down the drain periodically to keep the tank from freezing. • Since the snow has not yet thawed here – we are having an exceptionally cold spring – we don’t know how much of a mess the wash water dumped off the back deck made. Next winter, the landscaping will be completed (I hope) and we need to figure out a better place to dump the water as there will be steps where it was dumped this winter. Living on the Ponderosa is like a big science project. Research, brainstorm and try it out. Review, revise and re-try. Generally the simplest solution works best. Always something to learn. We will see how we do next winter. This entry was posted in Water and tagged cisterns, grey water, holding tank, rain water, rain water collection. Bookmark the permalink.